National Election Committee officer shows the logo of the ruling Cambodian People's Party (CPP) during a drawing lots to determine the order of political party on ballot papers for July election, in Phnom Penh, Cambodia, May 29, 2018. A new list of controversial rules for journalists covering Cambodia's upcoming elections, including a warning that the reporters should not ask detailed questions about the result, is drawing criticism from observers who say the provisions are worryingly vague and subjective. The National Election Commission (NEC) this week said journalists should not have their "own ideas to make conclusions" while reporting. The code of conduct also forbids reporters from conducting unauthorized interviews at polling booths or broadcast news that leads to "confusion and loss of confidence" in the election. A code of conduct for reporters covering the ballot released by the NEC this week also forbids journalists from expressing "personal opinion or prejudice" or publishing news that "affects political and social stability." NEC spokesman Hang Puthea said on Thursday the provisions meant journalists covering the election "should not have your own self-evaluations and ideas." He added that reporters should also not ask about who had won at different ballot boxes or how many seats had been secured by different parties. He could not explain how a journalist was supposed to cover an election when prevented from performing such basic, fundamental reporting tasks. Those who violated these provisions would be fined under the election law, he said. Article 142 of the election law imposes fines of 5 million to 30 million ($1,250 - $7,400) for such infractions. Hang added that reporters would be able to ask questions at polling stations only if they obtained permission from the head of that station and could not ask people who they voted for. Phil Roberston, deputy Asia director at Human Rights Watch, said the NEC guidelines indicated the Cambodian government was deeply concerned that the election will be ridiculed internationally as "pre-determined." "What's astonishing, is these guidelines and these accompanying missives by the authorities show a game plan by Cambodia to try and control the narrative now even two months before the election," he said. "What they don't want to have is media reporting that this is a bogus election, that this is a farce election, this is an election that's a joke because the registered opposition, the really only viable opposition in the country was dissolved well before the election," he said. Member of the dissolved opposition Cambodia National Rescue Party (CNRP) Ouk Pich Samnang reacts inside a police vehicle on his way to attend a verdict announcement at the appeal court in Phnom Penh, Cambodia, May 10, 2018. 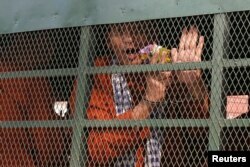 The Cambodia National Rescue Party, which nearly toppled Prime Minister Hun Sen's regime last election, was dissolved in mid-November and its leader has languished in jail for more than eight months. Most of its senior members have fled the country and have been banned from participating in politics. Hun Sen, who has ruled for more than three decades, claims the party was orchestrating a color revolution backed by the United States and its western allies. With no credible opposition on the ballot, the government has been threatening people who are considering not voting even though it is not compulsory under Cambodian law. On Thursday Hun Sen warned in a speech that criminal action would be taken against anyone trying to fool authorities into thinking they had voted. "They have plan, they will not go to vote on this election day but they will dye the finger with the hair dye. What is this? This is a criminal offense of fraud," he said. Last year, as pressure on the opposition escalated, Hun Sen also launched an attack on press freedom. In late August, 32 radio frequencies that carried content at times critical of the government, from outlets including VOA, were shutdown. The following month Radio Free Asia shutdown its local office sighting threats and intimidation and shortly afterward two of its former reporters, Uon Chhin and Yeang Sothearin were arrested and jailed on espionage charges. FILE - A woman buys the final issue of The Cambodia Daily newspaper at a store along a street in Phnom Penh, Cambodia, Sept. 4, 2017. 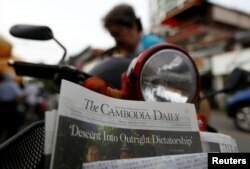 The Cambodia Daily, a foreign-owned English language newspaper that scrutinized the government closely, also shutdown in September after they were handed a $6.3 million tax bill that the owners said was concocted to force their closure. Last month The Phnom Penh Post - the last critical voice in Cambodia's newspaper market - was sold, after the Australian owner was handed a $3.9 million tax bill. The tax bill was settled under terms none of the parties will reveal and days later the editor-in-chief, Kay Kimsong, was sacked after the paper published a story examining the background of its new owners. Almost every senior foreign staff member subsequently quit. Following heavy international media scrutiny of the deal Sivakumar S. Ganapathy, the group managing director of Asia PR - who also goes by the name Siva Kumar G., held a press conference in which he said he was unaware of any media crackdown in Cambodia. Ganapathy said there had been no government involvement in his firm's acquisition of The Phnom Penh Post. Kann Vicheika contributed to this report . Disclosure: David Boyle worked as a senior reporter, managing editor and digital media director at the Phnom Penh Post between 2010 and 2015.